The mechanism that transmits engine four to the rear wheel (in case of rear wheel drive vehicle) or to the front wheel. (In front wheel drive vehicle) or to all the four wheel (in four wheel drive vehicles) is known as a transmission system. The gear box and its associated units perform the following function on. A gear box assists in variation of torque (or tractates effort) produced by the engine in accordance with the driving conditions. A large torque is required at the start of the vehicle and a low torque at higher speeds. It helps in smooth running of the vehicle at different speed since variation a torque induces. Several kinds of transmission are employed on auto vehicles. These can be classified as follows. Sychromesh gear box with over drive. Electric controlled with a avid drive. Electric controlled with over drive. It is simplest type of gear box out of the available gear boxes. In this type of gear box, gears are changed by sliding one gear on the other. This gear box consists of three shafts; main shaft, clutch shaft and a counter shaft. In a four speed gear box (which includes one reverse gear), the counter shaft has four gears which are rigidly connected to it. Clutch shaft has one gear and main shaft has two gears. The two gears on the main shaft can Transmission slide in the horizontal direction along the splines of the main shaft. However, the gears on the counter shaft cannot slide. The clutch gear is rigidly fixed to the clutch shaft. It is always connected to the countershaft drive gear. The two gears on the main shaft can be slided by the shifter yoke by operating the shift lever (not shown in Figures). These two gears are second gear and low/reverse gear respectively. These gears can be meshed with corresponding gears on the countershaft with the help of shifter yoke and shift lever. Shift lever is operated by hand in four wheelers for changing the gears. A reverse idler gear is mounted on another (third) shaft and is always in mesh with reverse gear on countershaft. 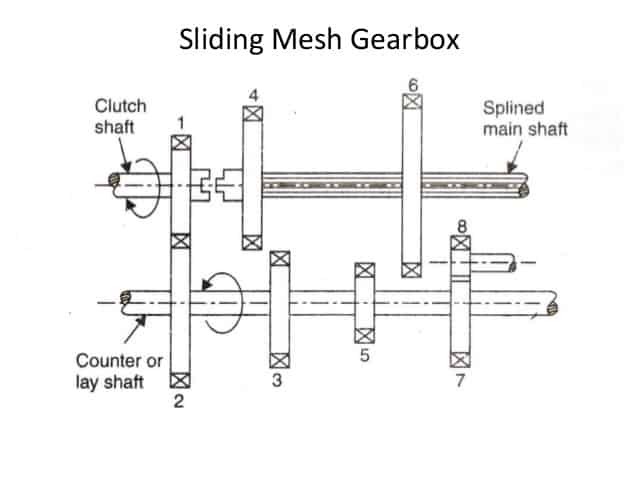 Figure shows sliding mesh gear box in neutral position. In this position, the engine is in running condition, clutch remains engaged and clutch gear drives the countershaft drive gear. The direction of rotation of countershaft is opposite to that of clutch shaft. In this position Ist, IInd and IIIrd and reverse gears are free. Thus, main (transmission) shaft does not rotate and automobile wheels do not rotate. So vehicle remains stationary. When first gear position is selected by the shift lever, first gear (large gear) on the main shaft slides and is connected to first gear on the countershaft. The direction of rotation of main shaft is same as that of clutch shaft. In first gear, small gear of countershaft meshes with larger gear on main shaft, speed reduction in the ratio 3 : 1 (approximate) is obtained. When second gear is selected by the shift lever, second gear on countershaft meshes with second gear (small gear on main shaft) on the main shaft. The direction of main shaft is same as that of clutch shaft. Speed reduction of the order of 2 : 1 is obtained in second gear. In third gear, the main shaft is slided axially towards the clutch shaft so that main shaft is directly connected to the clutch shaft. In this position, the main shaft rotates at the speed of clutch shaft. Thus, a speed ratio of 1 : 1 is obtained. It can be noted that the clutch gear is directly connected to engine crankshaft and main shaft is connected to the wheels through propeller shaft. When the shift lever is operated to engage the reverse gear, the larger (reverse) gear of the main shaft meshes with the reverse idler gear. Reverse idler gear is always connected to reverse gear on countershaft. The reverse idler gear between countershaft reverse gear and main shaft larger gear changes the direction of rotation of main shaft. Thus, the direction of main shaft becomes opposite to that of clutch shaft. Therefore, wheels of the automobile start moving in backward direction. In modern cars, there are five forward gears and reverse gear. Hence, they provide five speed ratios for forward racing and one for backward movement.